The CAM 8080 will match, affix and mail a complete document with additional inserts (optional). 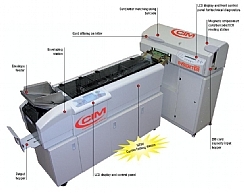 The unit can personalize the carrier with variable printing using a commercially available laser printer or it can feed a pre-printed document from an optional stream feeder. The system offers 100% data match between the card and the carrier using a read back function and real time database access. The CAM 8080 has a new transport system for the card and the carrier and together with the optimization of the labelling station offers a throughput of up to 2.000 cards per hour. The CAM 8080 is available in three different versions to satisfy even the most demanding production requirements.